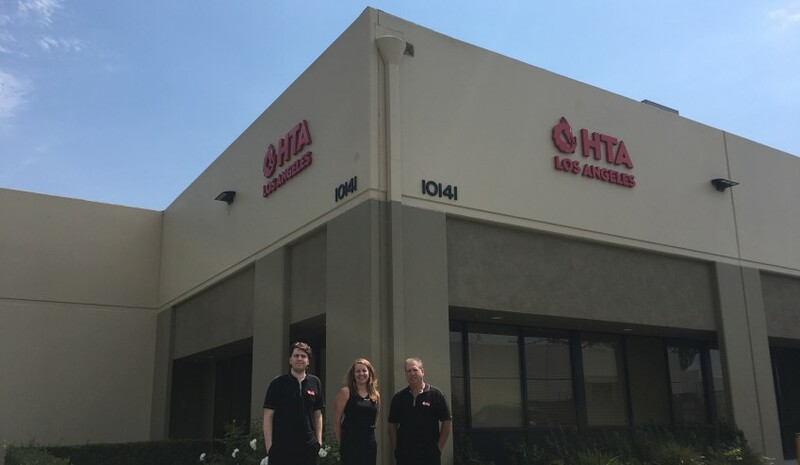 Heat Treatment Australia owner and director Karen Stanton with operations manager Braden Hamwood (left) and branch manager Mitch Fahrney (right) at the newly accredited HTA thermal processing facility in Santa Fe Springs, Los Angeles, CA. Photo Credit: Heat Treatment Australia. A Queensland-based company and F-35 supplier has achieved two important milestones, with two of the world’s largest global defence companies. Heat Treatment Australia (HTA), based in Brisbane, has been awarded a contract by BAE Systems' Controls and Avionics Solutions, based in Fort Wayne, Indiana, for the supply of pressure manifolds for commercial aircraft jet engines in the US. The pressure manifolds are part of the digital engine controls for the LEAP family of jet engines. The LEAP engines will power some of the biggest fleets of commercial aircraft in the world, including Boeing 737 MAX and Airbus A320neo. HTA will use its recently opened state-of-the-art thermal processing facilities in Brisbane to assemble the manifolds. BAE Systems Australia CEO Glynn Phillips said the contract is a stellar example for other Australian companies looking to break into global supply chains and export markets. "This is a great demonstration of how competitive, innovative Australian companies can compete on a world stage and become part of BAE Systems global supply chain," said Phillips. "Providing access to international opportunities for Australian businesses supports growth and sustainment of Australia’s competitive defence industry. "Success for Australia’s industry works to promote innovation, improve our ability as a nation to compete globally and generate exports and jobs." HTA has also achieved accreditation with Lockheed Martin to process work in their newly established facility in Santa Fe Springs, Los Angeles, California. The company established the new facility in Los Angeles, its first outside of Australia, to make its unique thermal processing services available to the local US market, and to process stainless steel orders from Australian companies before the raw material leaves US shores. "HTA’s expansion into the US, and its new facility’s subsequent quality accreditation by Lockheed Martin, are a testament to the vision and commitment of the HTA team," said Vince Di Pietro AM, chief executive Lockheed Martin Australia. "Lockheed Martin Australia, via its Global Supply Chain Program efforts, is proud to assist an Australian company achieve significant supply chain efficiencies and export intellectual property developed here in Australia. "HTA’s growth and success as a proven supply chain partner has reinforced the company’s ability to provide world-class innovation to the aerospace sector further reinforcing the value of the F-35 industrial participation program to Australian industry." Over 50 Australian companies have contributed to the F-35 program to date, with a contracted value (as at December 2016) of over $800 million, sustaining high-tech manufacturing jobs for Australian industry. “We hope this new US facility will provide opportunities for HTA to collaborate with other Australian companies, and that our US-based thermal processing capabilities will be an asset to Australian industry,” said Karen Stanton, owner and director of HTA Group. “The Lockheed Martin accreditation is a significant milestone for HTA’s global ambitions and confirms we are ready to deliver for our partners." “HTA’s entry into the US market aligns with the Australian government’s 2016 Defence Industry Policy Statement, and will subsequently boost Australian Global Supply Chain opportunities, creating more jobs and economic benefit to Australia." Minister for Defence Industry Christopher Pyne, upon congratulating the company for their achievements, said the HTA accreditation would create more jobs for Australians as the company would need additional infrastructure and staff in Australia to support US operations. "Four additional positions are already in place to support the international expansion, including a chief finance officer to manage the expanding scope of HTA business," said Minister Pyne. Australian companies can now direct their raw material orders through HTA in the US, which will promote collaboration between Australian industry supply chain partners. To assure competitiveness, HTA has partnered with RUAG Australia to provide precision machining and high pressure testing services. Minister Pyne said the Australian government’s Global Supply Chain Program had been integral in enabling the Lockheed Martin accreditation of HTA’s newest facility in the US and the contract signing with BAE Systems. "The Global Supply Chain Program, run by the Centre for Defence Industry Capability, has delivered for HTA," the minister said. "This will increase Australian companies’ competitiveness in the US and other global markets and gain access to new global supply chain opportunities. "This is an excellent example of how the Australian government is working with our defence industry base to grow export opportunities and increase Australian participation in global supply chains." Over 140 companies have been awarded contracts totalling over $830 million under the Global Supply Chain Program. Further information on the Global Supply Chain Program and the Centre for Defence Industry Capability is available here. HTA is the only aerospace heat treater in Australia with AS9100 and Nadcap accreditations. The company has branches in Brisbane, Sydney, Melbourne and now Los Angeles.